A 'go to' recipe of mine. 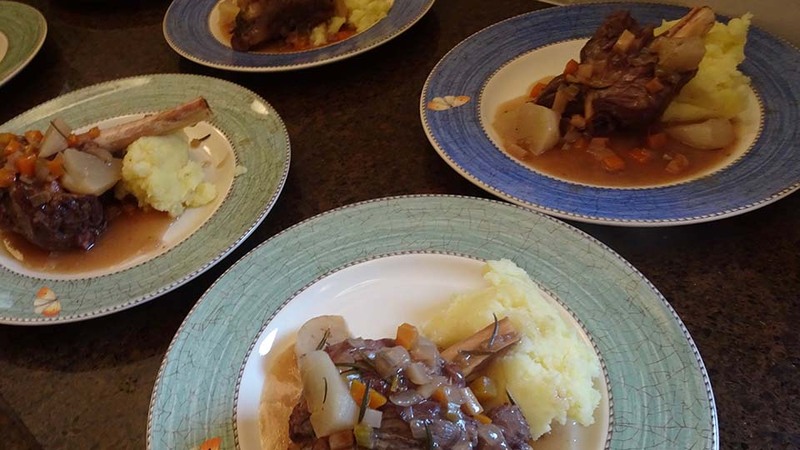 Slow cooked lamb shanks that my mum tells me has a flavour like no other… She thinks it is because I make and use my own lamb stock, but don’t let that stop you. I believe you could use a good chicken stock if you don’t make your own lamb stock. The meat just falls off the bone and the sauce is delicious. Add the lamb shanks and brown. Remove from pot and set aside. To the same pot, add the diced vegetables and finely chopped garlic and sauté until the onion is tender. Turn up the heat and add the shanks and red wine, cook until the red wine has reduced by half. Add the stock and rosemary and bring back to the boil. Season with salt and pepper. Reduce heat and cover with a “cartouche” before placing the lid on and reducing the heat to a very gently simmer. Simmer for 1 ½ hours, add the wedges of turnips, and continue cooking for a further hour. Finally blend the cornflour with a little water and stir into the liquid around the shanks, bring back to the boil, simmer for a few minutes. Serve hot with creamy mash potato. Frenched lamb shanks, are trimmed so that the bone is scraped clean and cut shorter making them look much more elegant when cooked and plated. For a cartouche, simply cut a circle of parchment/baking paper slightly larger than the dimension of your pot, scrunch it up and place under running cold water to dampen and soften it. Flatten it and then place it onto the liquid surface of a casserole, soup, stock or sauce. This slows down the evaporation, prevents a skin from forming and helps to keep the ingredients submerged, as well as moist.